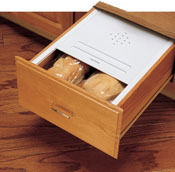 The Bread Drawer kit allows you to convert an ordinary drawer into a usable storage space for bread, rolls, and other bakery products. The kit includes 1 cover, 1 pair of rails and the necessary screws.The Bread Drawer Covers are available in White, Almond or Translucent Finishes. Both sizes can be trimmed to fit the dimensions of your drawer. .